Participation in telephone surveys has been on a downward decline nearly since the popularization of telephonic research (see Curtin et al, 2000). How low have they gotten, and to what effect? Can we still have confidence that survey results from telephone surveys are valid and reliable? In terms of declines in participation, Curtin and colleagues measured response over time in the Survey of Consumer Attitudes (2000; 2005), reporting a response rate of 72 percent in 1979 and 48 percent in 2003, with a quite linear trend between the two points in time. Prior to the Curtin et al. article, Steeh (1981) explored response in the National Election Surveys and the Survey of Consumer Attitudes from the early 1950s to 1979. Her research unsurprisingly found a significant increase in nonresponse over that period of time. Bradburn continued to show the same trends through the 1980s in his 1992 article. Importantly, the decline in response has been endemic, spanning across sectors and survey types (Brehm, 1994). Overall, research makes it clear that nonresponse has consistently increased from the 1970s to 2000 (Singer, 2006). More recently, the National Research Council extended many trends to 2011 in its report on nonresponse (2013). percent from 1991 to 2007; the National Immunization Survey from 87 percent to 64 percent from 1995 to 2010; and the BRFSS from as high as 65 percent to the mid-30 percent range from 1996 to 2010. Notably, the studies cited above are high effort, high response rate studies, many of which utilize an in-person interviewing design, and only report trends up to 2010. What about more recent policy research surveys or the more typical public opinion polls? Pew reported on trends in their own studies, which revealed a response rate decline from 35 percent to 9 percent from 1997 to 2012 (Pew Research Center, 2012). The California Health Interview Survey adult module response rate declined from 38 percent in 2001 to 8 percent in 2017. And the Survey of Consumer Attitudes, noted above as attaining a 48 percent in 2003, now has a response rate in the single digits. CBS poll response rates have declined from 19 percent in 1999 to 5 percent in 2015 (using AAPOR’s RR1, a more conservative estimate than the traditional RR3 calculation), and ABC polls have declined from 28 percent in 1997 to a rate of 9 percent in 2018. Importantly, efforts to assess the degree to which lower survey response has led to survey bias have almost exclusively found null effects. Keeter and colleagues (2000) manipulated a high response rate survey (61 percent) and deleted hard-to-reach cases to generate a low-response rate (36 percent) survey of the same data. This afforded them the ability to compare measures against themselves directly with no concern for measurement error or other potential confounds. They found almost no significant differences between the high and low response rate versions of their survey. The 2006 replication and expansion of this research (Keeter et al, 2006) found largely the same results, with 7 out of 84 tests of differences marginally statistically significant between a survey that attained a 50 percent response rate compared to one that only achieved 25 percent. Groves and Peytcheva (2008) used a meta-analytical approach to investigate non-response, utilizing 59 surveys with varied level of effort and response. Measures of response and quality, such as the use of prenotifications, did not significantly influence bias. This is similar in nature to other research by Groves (2006), also finding little impact of nonresponse on bias. Research since the early 2000s is sparse. Dutwin and Buskirk (2017) found that surveys with response rates under 10% showed little bias compared to the National Health Interview Survey, an in-person design that attains response rates in the upper 70 percent range. 3) A period of bias decline since 2007 (see table below). 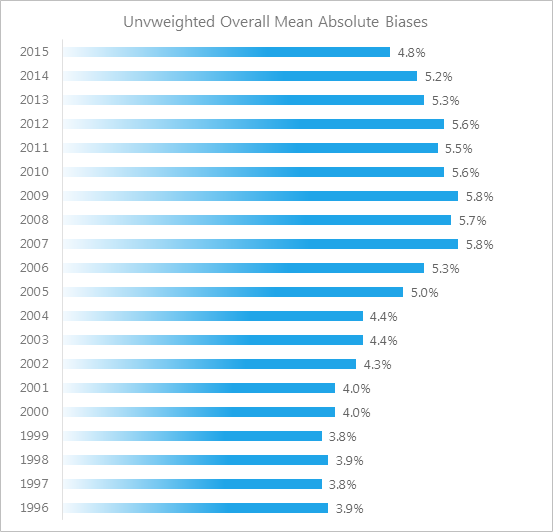 Current 2016 estimates of bias are on par with where they were before the “Stage 2” increase began. The authors argue that bias in the mide-2000s appears to have more to do with design issues, namely under-representations of respondents reached by cell phone, than a product of nonresponse. In fact, studies with sufficient cell phone interviews during that time period show no trends in increasing bias over time. Bradburn, Norman (1992). A response to the nonresponse problem. 1992 AAPOR Presidential Address. Public Opinion Quarterly 56 (3): 391–397. Brehm, John (1994). Stubbing our toes for a foot in the door? Prior contact, incentives and survey response improving response to surveys. International Public Opinion Research, 6 (1): 45–64. Brick J. Michael & Tourangeau Roger, 2017. “Responsive Survey Designs for Reducing Nonresponse Bias,” Journal of Official Statistics, Sciendo, vol. 33(3), pages 735-752, September. Curtin, R., Presser, Stanley, and Singer, Eleanor (2000). The effects of response rate changes on the index of consumer sentiment. Public Opinion Quarterly 64: 413–428. Curtin, Richard, Presser, Stanley, and Singer, Eleanor (2005). Changes in telephone survey nonresponse over the past quarter century. Public Opinion Quarterly 69 (1): 87–98. Dutwin, D., and Buskirk, T. (2018). 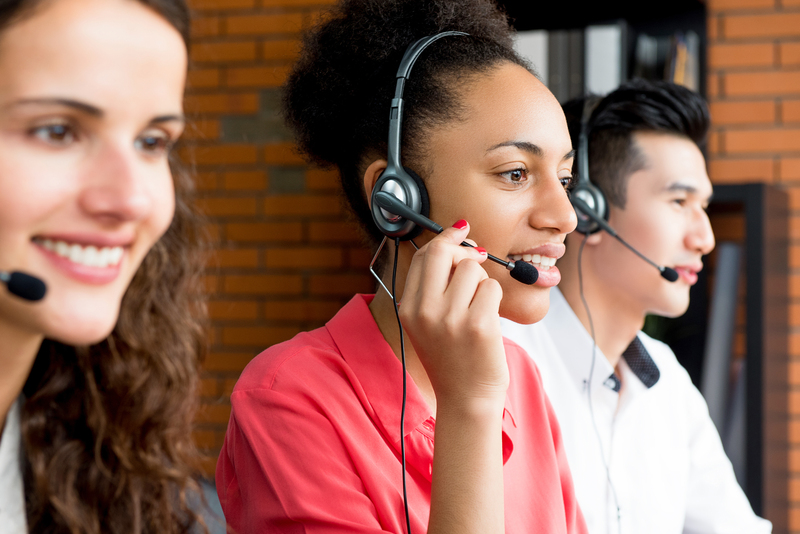 Telephone sample surveys: dearly beloved or nearly departed? Trends in survey errors in the age of declining response rates. Unpublished manuscript under peer review. Groves, Robert M. (2006). Nonresponse rates and nonresponse bias in household surveys. Public Opinion Quarterly, 70 (5): 646-75. Groves, Robert. M. and Peytcheva, Emilia (2008). The impact of nonresponse rates on nonresponse bias. Public Opinion Quarterly 72: 167-189. Keeter, Scott, Miller, Carolyn, Kohut, Andrew, Groves, Robert M., and Presser, Stanley (2000). Consequences of reducing nonresponse in a large national telephone survey. Public Opinion Quarterly, 67: 125-48. Keeter, Scott, Kennedy, Courtney, Dimock, Michael, Best, Jonathan, and Craighill, Peyton (2006). Gauging the impact of growing nonresponse on estimates from a national RDD telephone survey. Public Opinion Quarterly, 70 (5): 759-779. Pew Research Center (2012). Assessing the Representativeness of Public Opinion Surveys. Accessed at http://www.people-press.org/2012/05/15/assessing-the-representativeness-of-public-opinion-surveys/. Silver, Nate (2014). Is the polling industry in stasis or in crisis? (August 25, 2014). Retrieved from http://fivethirtyeight.com/features/is-the-polling-industry-in-stasis-or-in-crisis/. Singer, Eleanor (2006). Introduction: Nonresponse bias in household surveys. Public Opinion Quarterly 70 (5): 637–645. Steeh, Charlotte G. (1981). Trends in nonresponse rates, 1952–1979. Public Opinion Quarterly 45: 40–57. Tourangeau, Roger, and Plewes, Thomas J. (eds. 2013). Nonresponse in Social Science Surveys: A Research Agenda. A report by the National Research Council of the National Academies. Washington, DC; National Academies Press.